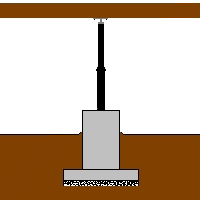 This tutorial explains how to pour concrete footers for jack posts used in house raising or leveling sagging floors, porches, sun decks and room additions. Traditionally built short and stout, they can also take a vertical form with a proper base. Usually steel reinforced and poured with high-strength concrete, these footers should long outlast the supported structure. 1. 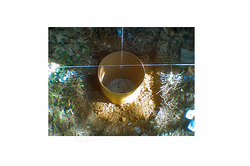 Layout the location of your footers, using wooden stakes, a string line and surveyors spray paint. 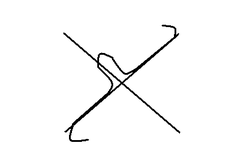 Mark off and clear the area of debris. 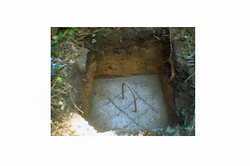 If your footers will support an existing structure, use one or more weighted plumb-lines to insure proper placement. 2. Excavate the holes for your footers. Dig down to or below the frost line, the minimum depth your footers must go to prevent heaving. Contact your local Building Code Enforcement office to find out just how deep the frost line is in your area. 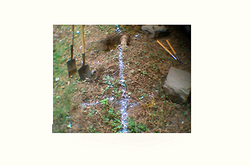 On this job, for example, the frost line required a minimum depth of 18". Each hole dug to a depth of 24" and squared with a flat shovel. Do not to dig deeper or wider than necessary, to avoid disturbing compacted 'virgin soil.' The terracotta drain pipe visible in this photo, an abandoned underground drain for the original gutter & downspout system damaged from frost heaving, was removed. 3. Reinforce each footer. Code requires Rebar steel used as reinforcement. The amount and construction will differ, depending on use and location. The footers on this job, a combination of pad & column, made it necessary to tie them together. I used both 1/2" & 3/8" Rebar steel to accomplish this. Tie two 1/2" x 18" bars together to form an X, using 18 gauge solid steel wire. Next, bend a 3/8" x 48" bar, with a high upward loop, and tied it to the X with steel wire. As you can see from this photo, the Rebar reinforcement fits nicely, a few inches short of coming into contact with the perimeter of the hole. The steel will float within the concrete to avoid contact with the soil or gravel. 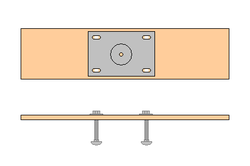 Extremely important, since surface exposure would allow moisture to contact the steel and the subsequent corrosion would severely undermine the strength and longevity of the footer. 4. Build the base slab. The base, an 18" x 18" x 6" slab of 5000 psi concrete poured on top of 2" of packed gravel. The gravel aids in drainage, especially necessary in high clay soil. In a wheel barrow, add water to the powdered concrete, combine and mix with a shovel until you reach an oatmeal-like consistency. Shovel this mix into the hole. Using a length of wood dowel, work it up and down through the concrete to remove any air bubbles. The Rebar floats midway in the base, held in place with a string line until the concrete sets. Level the concrete, using a finish trowel. To assist in bonding, scratch a few lines into the wet concrete, in preparation for the column. 5. Cut the 12" x 48" form tube to length and center it on the pad. Back fill the against the tube with loose soil to hold it in place. Using a 2' Level, check front to back and side to side for vertical alignment. 6. Set the carriage head/anchor bolts to accept the base of the jack post. With your footers exactly centered, you can opt to set anchor bolts into the concrete, rather than drilling into this high strength concrete afterwards. To do this, center the jack post base onto a 1/4" x 6" piece of plywood long enough to span the tube. Mark and drill the four bolt holes. Insert the 4 carriage head bolts and install the flat washers and nuts. Flush the bolts with the nuts, to set them deep in the concrete. The plywood spacer, once removed, will provide enough exposed bolt for the lock washers. 7. Submerge the carriage head/anchor bolts once you have filled the tube with concrete, worked out the air bubbles and double-checked your level. Work them down into the concrete with a wiggle-like motion, to properly settle them into the mix. Be sure to center them with your horizontal straight line as well as with a weighted drop line from above. 8. Strip the Form, after the concrete has had time to set. Remove the washers & nuts, plywood and the loose soil exposing the top of the base. Score the form with a utility knife and peel it away. 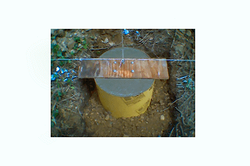 After a minimum of 24 hours exposure, the concrete has cured enough to support weight. the concrete to fully cure before application. You may need to construct a barrier out of plastic sheeting to protect the concrete from the elements during this time. Apply the sealant liberally, using a wide paint brush, allowing it to penetrate the surface. 10. Back fill the hole, compacting the soil as you go, once the sealant has dried. Crown the soil against the concrete to direct water runoff. * Extend your adjustable jack post until it fits snugly between the footer and the structure, then lengthen it by an extra ½ turn only. Allow 24 hours for the structure to "settle," before raising it another ½ turn. * If using more than one jack post, adjust to achieve level before adjusting to raise the structure. Then adjust each jack evenly. * These Footers can and should also be used with solid, non-adjustable, posts in new construction. Prevent sagging from the start! * Raising a sagging floor in a house? Basement floor concrete is typically no more than 4" thick at best and will crack! 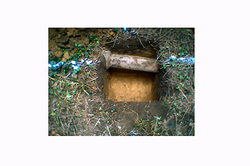 * Contact your local Utility company and have them locate underground services before you dig! * When raising a sagging structure, it is important to go slowly otherwise internal pressures will tear it apart. * Sealing damp concrete will trap moisture inside which will expand when frozen and cause cracks. * Be sure to present your plans and obtain all applicable building permits before construction.